For many business owners, calculating the return on investment of a new technology purchase can be tricky. Some may not even see the value of calculating it, and therefore skip this step. This, however, can be a costly mistake to your business because if your technology isn’t saving you money, it’s costing you. 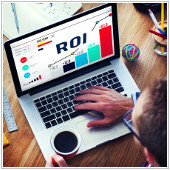 Here are some tips to help you understand technology ROI and how to calculate it. What does it mean to have a positive return on investment? It’s pretty simple. A positive ROI means the results a technology produces are greater than or equal to the amount of time and money invested. Obviously you want a positive ROI, but when is the right time to consider it? Should it be before or after you make a technology purchase? The answer is both. Before purchasing, you want to carefully consider whether a technology service or product is worth your money. Then months after you’ve implemented it, you should analyze whether or not you made a good investment. Doing this enables you to learn from your mistakes (if you made one) and make a wiser technology purchase next time. Also, don’t forget to look at your technology currently in use. Ask yourself, is your technology simply keeping the lights on? Or is it providing a solid foundation for your business to grow? If the answer is the former, there are likely better options out there worth trying. When calculating ROI, it doesn’t have to be perfect. Here is a simple formula to get you started. If you’ve yet to purchase a service or new equipment, you obviously don’t know how much profit it will generate. So you’ll have to do a bit of guesswork and estimation. It’s also important to consider some intangibles. Think about the productivity costs of staff time, disruption, and frustration (because most of us don’t work effectively when frustrated). Let’s take staff time for example. How much time will your staff save if you implement a Managed Services solution? With your employees no longer having to put out IT fires daily, what if your entire staff saves 50 hours a week because of it? How much does that add up to in saved salary expense? It’s important here not just to think about the savings in time, but also what your staff could be doing with those extra 50 hours. They could put those hours towards marketing or growing your business. And that alone could make up for the costs of the technology investment itself. Intangibles don’t just apply to saving time, frustration and disruptions, but also the costs of implementing the new technology. For example, how much time will be required to train your staff on the new technology? What’s the cost of that? Also, how much time will it take to migrate from your old system to the new one? You should consider all of these when estimating your ROI. Lastly, don’t forget to consider the unique circumstance of subscription purchases. Since you are usually paying these on a monthly basis, it can be a bit tricky to add up real costs. That’s why it’s important to use a timeline for these. For example, if you subscribe to software as a service, what’s the cost of that plan over the course of one year or five? How much money will you save over that time span? Besides the staffing example mentioned above, consider how a technology investment can create new revenue streams. For example, an investment in VoIP opens up an opportunity to offer video consulting to clients in parts of the country (or even world) that would normally be out of reach. This obviously leads to a new revenue stream and increased profits. So ask yourself, can the technology you’re considering create new revenue streams? Before making a technology purchase, it’s wise to talk with both management and end users about your decision. If you fail to consult your end users before implementation, they may disagree with your decision and therefore take longer to adapt or even rebel against it. Checking with them beforehand gives them a chance to offer valuable feedback on how it will be used in the trenches, and will get them onboard with the technology if you implement it. As for your management team, they can be a valuable resource to bounce ideas off of and gain insights about the technology you may have overlooked. Lastly, ROI does not need to be calculated for every purchase. If you need to buy something small, like a new keyboard, just go and buy it. Save your ROI calculations for much larger investments that can have a dramatic impact on your business. If you need help determining the ROI of a potential technology investment, feel free to give us a call for a chat. Our experts can help you determine the true benefits of a given technology and help you make a wise investment.